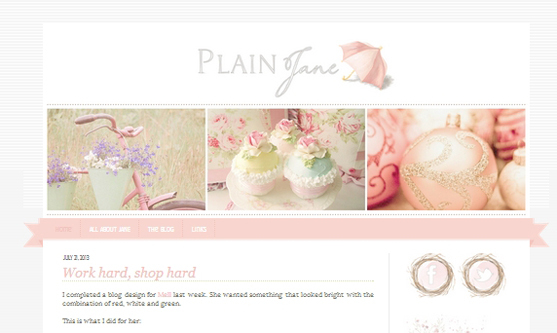 I've changed my blog header last night.. yayy!! This header really is a circumcise lie (tipu sunat), undeniable.. I knew. A header that designed by Jane a k a Cindy.. Her header/templates are friendly and sweet impression type, that's how I can describe it. The header is way too cute, I wished to borrow her creative brain for a day lol..
My new header is less color now. Super Simple. That was the words that I had in mind when I was on my own blog. The fact that I don't have much time to call my family and friends.. so I blog it.. I think that some of us are in the same boat, I mean bloggers love to write things that they've in mind or simply write anything that they like haha.. so, if you're here on this page, you're either a blogger or a person who loves reading. Claps Clapsssss!! Your new header banner is very nice and Avant Garde! So your blogs are being read by family and friends!!! I would hide mine from all of them! Thank you! It looks ordinary for me hahaha..
Well, there's always a good reason for hiding the blog/social network, some family/friend simply just doesn't deserve to. That's a very nice artistic blog header! Well done!